Research among more than one thousand employees and five hundred employers has revealed the importance of not only comfort, but also aesthetics, to the success of workplace safety eyewear. Undertaken by YouGov on behalf of Specsavers Corporate Eyecare, the research revealed the importance of comfort when employees were asked whether they have ever removed their safety glasses when it was not safe to do so. Almost a quarter, 24% admitted to doing so, because their safety glasses were not comfortable. This figure may be even higher if employers’ beliefs are correct. Asked what they thought employees would do if their safety glasses were uncomfortable but it was not safe to remove them, employers most commonly believed employees would remove them and carry on working anyway. This answer was given by 35% of employers. 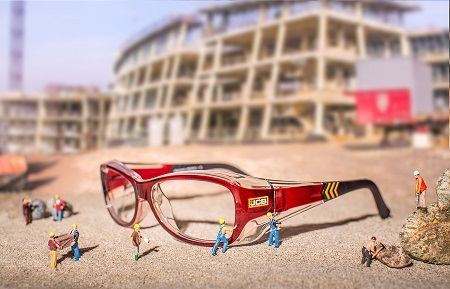 The research also showed that almost three-quarters of employees (73%) said they would be more likely to wear safety glasses if they liked the appearance and design. This compares to a very similar 74% of employers who thought that pleasing aesthetics would make employees more likely to wear their safety eyewear. Perhaps the biggest impact on comfort for the wearer is in offering prescription safety eyewear, rather than expecting wearers of glasses to use over-goggles. This out-dated option causes an unacceptable refraction of light, due to the two sets of lenses, and it is clearly less comfortable to be wearing two pairs of eyewear. Over-goggles are also not a good look! Comfort issues can be addressed by procuring safety glasses in light-weight materials, and considering the small details, like providing options with comfort temple-tips. Larger frame sizes are now available, like the new JCB All Terrain frames. Lens options can be a big decider in comfort. If an employee wears varifocals or bifocals in everyday life, these will be the most comfortable options for lenses in their prescription safety glasses. Anti-reflection treatments, reaction lenses and ultra-clear treatments may be necessary for certain roles but they may also provide greater comfort in the right situation. As the research has shown, offering a choice of style is very important. Wraparound-style glasses, like the JCB 5CX design, are becoming increasingly popular. Offering a wide range of options, with both male and female designs is often appreciated, with women’s frames tending to be slimmer and in different colour ranges.